NEW YORK -- You know you need to exercise more, but there's always next week, or the week after. To entice you to stop procrastinating, your company or insurer might soon reward you for wearing a fitness device to track your steps, heart rate and more. For instance, in one program announced Wednesday, some workers can buy a $350 Apple Watch for just $25 by meeting exercise goals for two years. Miss goals, and see your discount shrink. Vitality, a provider of disease-prevention and lifestyle programs, is initially bringing the offer to U.S. employees at three companies, along with John Hancock life-insurance customers. It has been testing the program in South Africa since December. Other programs let you redeem points from fitness activities for gift cards and other rewards. Submit to biometric screenings and nutrition classes, and in some cases you can earn insurance discounts. "We all live busy lives, but the truth is, if doctors could write one prescription for the world, it would be activity," says Jeff Williams, Apple's chief operating officer. Programs like these are still new, but appear to be expanding as part of broader changes in the health care marketplace. On Tuesday, health insurer UnitedHealthcare started offering up to $1,460 a year in credits toward deductibles for meeting daily goals while wearing a custom tracker. Oscar, which sells health insurance directly to consumers, has been giving out free Misfit trackers for opportunities to earn up to $100 a year in Amazon gift cards. Fitbit works with employers such as Indiana University Health and Emory University in Atlanta to subsidize fitness trackers for their staff. "I love playing sports, but doing cardio stuff isn't my favorite," says Brett Broviak, 43, an IU Health employee in Noblesville, Indiana. He says getting a discounted Fitbit pushed him to walk 1 million steps a month. Top-selling blood pressure app "very inaccurate"
Mike Doughty, president and general manager of John Hancock Insurance, says premiums won't rise if a screening uncovers higher blood pressure or other risks. Rather, he says, wellness incentives are about promoting longer lives -- and collecting life-insurance premiums longer. There's no proof that providing fitness trackers directly lowers health care costs, but there's plenty of evidence that exercise leads to better health, which in turn can improve productivity and reduce absences. Michael Staufacker, Emory's director of health management, describes the thinking as a "value of investment and not a hard-dollar return on investment as it relates to medical or pharmacy costs." "If I exercise regularly, then junk food just doesn't appeal to me," says Mark Holloway, 55, of Clemmons, North Carolina, who participates in Vitality's wellness program through his employer, Lockton. "French fries and hamburgers? No, thanks. It's like putting sand in your gas tank." "You change one thing about your behavior, and you can be more motivated to work on these other aspects," says Tammy Smith, who manages the employee wellness program at IU Health. DaVita HealthCare Partners says health care spending by its employees slowed significantly after it offered tracker-based incentives through Vitality. But DaVita also increased the deductible on claims and started such initiatives as Fresh Fruit Wednesday. That makes the effect of the fitness program difficult to isolate. With the Apple Watch program, you must pay back Vitality each month you miss your fitness goals, which typically call for four substantial workouts a week. The goals are meant to be achievable, but tough enough to change habits. 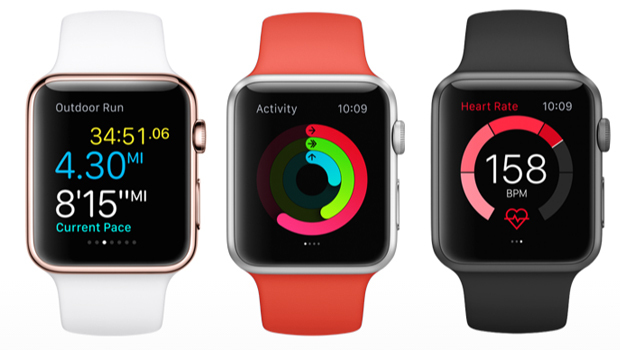 You can get more expensive Apple Watch models by paying the difference.